In order to encourage research and development in the country, University Grants Commission (UGC) has laid out a number of schemes, awards, fellowships, chairs and programmes under which financial assistance is provided to institutions of higher education as well as faculty members working therein to undertake quality research in almost all areas of knowledge across disciplines. From the year 2014, the President of India as the Visitor of Central Universities has instituted the awards namely (i) Visitor’s Award for Best Research and (ii) Visitor’s Award for Best Innovation which has resulted in healthy competition amongst the Central Universities for research and innovation. The UGC, on behalf of the Government of India, has been implementing various collaborative academic programmes between India and foreign countries. UGC has been running Joint Research Programmes with countries like USA, UK, Israel, Norway and New Zealand. UGC has also facilitated mobility of students, research scholars and faculty through programmes like Raman Fellowships for Post-doctoral Research in USA, scholarship programme called Stipendium Hungaricum with Hungary, Project-based Personnel Exchange Programme, Exchange of Scientists Programme and Indo-German Partnerships in Higher Education. 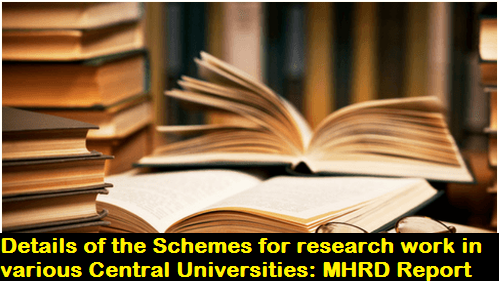 Under the Joint Research Programmes and other collaborative programmes, Higher Education Institutions in India have been able to engage with many foreign Universities of repute for research. University Grants Commission (Promotion and Maintenance of Standards of Academic Collaboration between Indian and Foreign Educational Institutions) regulations, 2016 were notified on 11th July, 2016. The Regulations apply to all foreign educational institutions operating in India through collaboration with Indian educational institutions other than technical institutions, and all Indian educational institutions other than technical institutions. These Regulations facilitate the Indian Higher Educational Institutions (HEIs) to enter into academic collaboration with foreign education institutions of repute. They are reviewed regularly by UGC for their performance. This information was given by the MINISTER OF HUMAN RESOURCE DEVELOPMENT SHRI PRAKASH JAVADEKAR today in a written reply to a Lok Sabha question.